Tonight was a feast here, here in Didipio Mine Site. 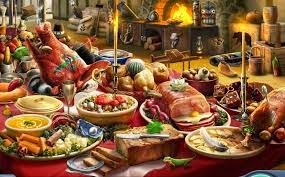 According to our Senior Pit Technician, every end of the month, this Aussie-Kiwi company hosts feast according to what they feel like celebrating. Tonight, it is Australian night. The food. My GAAAAAHHHDD. The food! Baby back ribs. Pure beef patty. Real French fries. Rice. Chaofan Rice. Beef afritada. Fish. Spaghetti. Macaroni. Lasagna. Choco Cake. Muffins. Egg pie. Chees Cake. Strawberry Cake. Rocky road ice cream. Caramel Ice cream. A salad bar where you can choose from a variety of fruit and vege mix. Too many to mention. It is like this every night. The company gets a catering service in the morning, lunch, and supper. So everything here is delicious. 1…2… 3… Happy New Year!